Have you struggled to meet your weight-loss goals through diet plans and exercise regimens? Dr. Babak Moeinolmolki offers patients the Obalon® balloon system, a cutting-edge, FDA-approved treatment plan that achieves stunning weight-loss results. To learn more about how just three swallowable capsules administered over the course of three months can change your life, call or use the convenient online booking tool today and schedule an initial consultation at Healthy Life Bariatrics in Los Angeles. Dr. Moeinolmolki offers the Obalon balloon system to help overweight and obese adults achieve weight-loss goals. 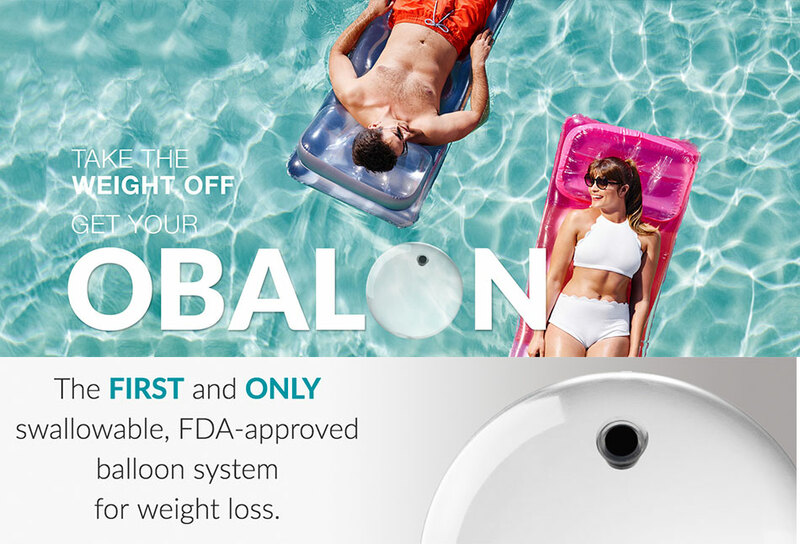 The Obalon balloon system is an innovative, FDA-approved treatment for adults who have struggled to lose weight through traditional methods such as diet and exercise. This safe, nonsurgical method that involves digesting small capsules that inflate inside your stomach might be right for you if you have a body mass index (BMI) between 30 and 40. Dr. Moeinolmolki gives you small capsules, or balloons, that you swallow. Once the balloon reaches your stomach, he inflates them with gas via a small catheter. The inflated balloon remains in your stomach and doesn’t harm any of your internal structures. It occupies space so that you eat less. A fully inflated balloon is comparable in size to a small orange and weighs about the same as a penny. In total, the procedure takes less than 10 minutes. Over the course of the three months, Dr. Moeinolmolki places three balloons inside your stomach. The schedule of treatment sessions depends on your weight-loss progress and how your body tolerates the balloons. You should experience gradual weight loss over a six-month period. After six months, he removes the balloons via an endoscopy procedure with light sedation. Am I a good candidate for Obalon? 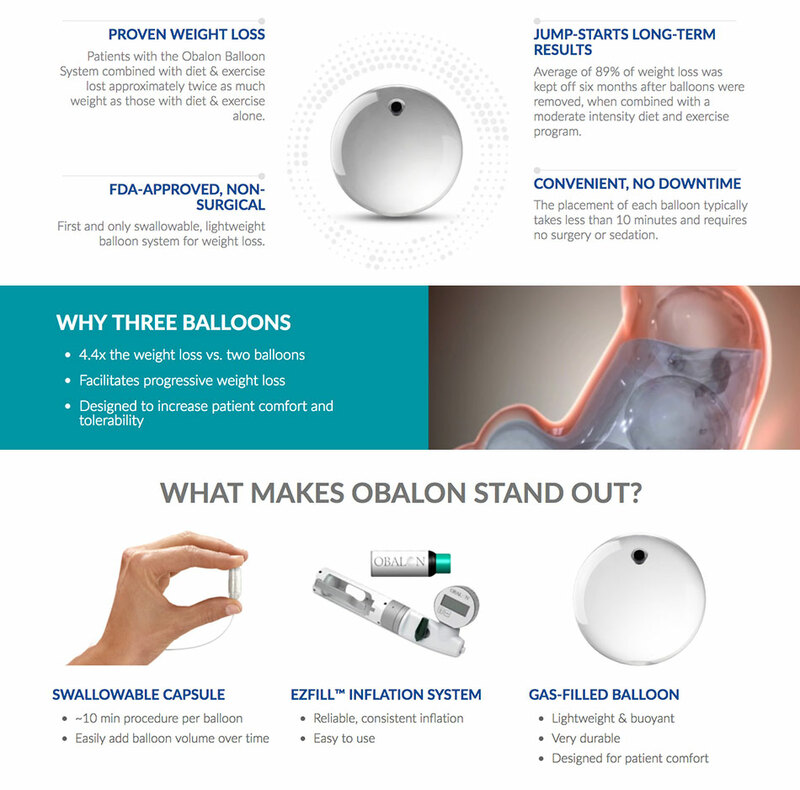 If you are approximately 30-100 pounds overweight, the Obalon balloon system could be the solution to your weight-loss goals. Dr. Moeinolmolki evaluates you at his Los Angeles office to make sure you are in the right BMI range to undergo treatment. However, the other component is your willingness to adjust to the necessary lifestyle changes. To help keep the weight off and maintain your well-being, you need to be mentally prepared to continue working on proper diet and exercise habits to maintain your Obalon results. Dr. Moeinolmolki discusses this with you and makes sure you understand that your long-term results depend on your commitment and follow-through post-treatment. Does Obalon have any side effects? The Obalon balloon system is very safe. The most common side effects reported are minimal and include short bouts of abdominal pain and nausea that typically subside on their own. If you have questions or concerns about the Obalon balloon system, call or use the online booking tool today and schedule a consultation with Dr. Moeinolmolki at his Los Angeles office.